- Manufactured By-Force Motors Ltd.
We offer totally tourist vehicle services in the capital Delhi and also offer 9 seater tempo traveller for group tours from capital. We have all kind of tempo travellers and luxury car rental services from the Delhi for station and out station tour packages. We offer tempo traveler with push back seat for tourist comfortable. 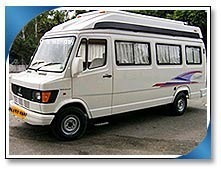 Our reputed entity is engaged in supplying 9 Seater Tempo Traveller Rental. Destination Location: Mumbai,Goa,Gujrath,Rajasthan,all over Maharashtra,Gujrath. Exclusive Mini Bus A C: PKN A/c. We are a top notch Tempo Traveller Provider Company 9517006009 offering 9 Seater Tempo Traveller Rental in Amritsar Call, Hire Tempo Traveller Services for Group Tours from Amritsar, Hire 9 - 12 seated Tempo Traveller In Amritsar Punjab. We Provide Luxury 9 Seater Tempo Travellers in Udaipur visiting and Outstation tour package. We are offering 9 seater tempo traveller for same day Udaipur Mount Abu , Nathdwara, Haldighati, Chittorgarh, Kumbhalgarh and weekend package for Ajmer, Jaipur, Pushkar Sightseeing and all of major destination of Rajasthan.